The VRDL All Stars is the team representing the VRDL on an international level and in the Women’s Flat Track Derby Association (WFTDA). Currently ranked #1 in the world, the All Stars won the 2017 WFTDA World Championships, and are currently the reigning runners up after winning silver at the 2018 WFTDA Championships. The All Stars started with a stella run, being the first Australian team to compete in the WFTDA. After walking away from four trips to the Big O in Eugene, Oregon undefeated and earning the first non-US team medal (bronze) at the WFTDA 2016 International Championships, the team backed up their previous years medal placing by cementing their number 1 ranking and securing the Hydra during the 2017 WFTDA International Championships. The Hydra win meant for the first time ever, the trophy had left the USA. In 2018, the All Starts continued to dominate on the track and at the 2018 WFTDA International Championships made their way into the Championship game and taking the silver medal. 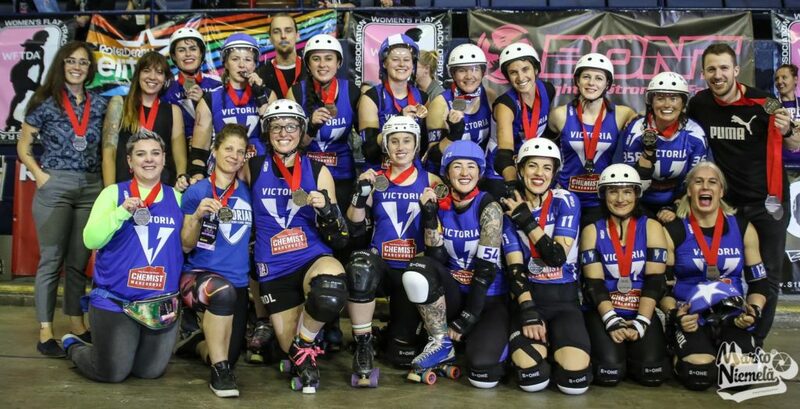 The team continues to prove their dominance and expertise within the International roller derby scene and are eager to continue their legacy in 2019. Known for being pioneers in the sport of roller derby, the VRDL All Stars are committed to changing the way the game is played. The team is consistently inventing revolutionary techniques and strategies, including braced walls and dynamic pack manipulation. The inventions are now staples in the sport and influence roller derby teams around the world. If you’d like to hire an All Star to coach your team or league, head over to our HIRE US page. If you’re interested in working towards a VRDL team, head to our GET INVOLVED page.